German footballer Sami Khedira recently sat down to answer some of our questions about the brand new FromAtoBeyond campaign, which is related to the trip planning and booking app . The world champion has not only been using the app to get from point A to point B, but also to explore his surroundings in between. Future users will be able to share experiences with their community, and inspire others to embark upon future adventures. Khedira, who lives in Madrid but hails from Stuttgart, embodies the international lifestyle of millions with trips home fitted between business in Rio and vacations in the States. What do you think are the driving forces behind #FromAtoBeyond and the moovel app? I’m curious about everything. That curiosity impels me to try new things all the time, and to travel to as many places as possible. We have so many beautiful destinations all over the world and moovel makes it easier to take the first step towards reaching them. The speed with which the moovel app operates allows for the fulfillment of spur of the moment ideas and wishes. I am always very spontaneous – when we get a day or two off, I often take the opportunity to drive somewhere and explore. It’s incredibly thrilling. The app comes in, and ensures that you don’t have to go through a tedious search across many different sites for a route that is still just an approximation. Could you explain what moovel is about? The represents an amazing opportunity to calculate the best possible travel itinerary by combining any and all methods of transportation. Every possibility, be it the public bus or a car2go vehicle, is taken into account. It’s totally new, and it works fantastically well. Does moovel have the power to move people emotionally, not just physically? Absolutely. But in this case the true advantage lies more with the individual user than with the community. It’s the individual who saves time and energy for other things, including emotionally rewarding activities, by letting the app carry the load. I’m active in social media but it certainly isn’t the main focus of my life. It is incredibly important for me personally to give back to my fans in any way I can though. They have always been there for me, watching the games, collecting autographs and jerseys. Social media is the best and most direct way to thank them. Are you aware of yourself as a role model when you post on the internet? That’s a difficult question to answer because I’m aware of my role as a celebrity, but I really just enjoy playing football. I try to live by the values that my parents taught me, and they have always served me well. If someone uses my conduct as an example, that’s great. Does it require courage to make the jump from professional on tour to a plain tourist? We’re all human. When I visit a city for the first time, it’s new to me the same way it is for anyone else. There is no jump, barely even a step. What is the ideal vacation for you? Do you prefer activities like skiing, or are you more the type to chill on the beach? I love to travel, and I try to experience as much as possible when I do. Sadly I can’t ski, in part due to the danger that risk of injury poses for my career. The ocean and the beach relax me, and give me strength. Of course mountains and other beautiful landscapes move me as well. Footballers seem to have a greater affinity for lifestyle and fashion than most other athletes, like boxers or gymnasts. Could you explain that discrepancy? Actually I can’t. I find it unfair to make generalizations about other athletes. As for me personally, fashion is important but not paramount. At the Oktober-Fest this year you received some criticism for your combination of lederhosen and sneakers. How did you come up with the idea? I just did what works for me, and then realized in the aftermath that it was a really cool combination of tradition and modernity. In the beginning it was just a spontaneous decision. In a way it mirrors what #fromAtoBeyond does: You make a great spur of the moment decision that you can reflect on later. How do you deal with that kind of criticism over your appearance? Thankfully that kind of criticism is rare. How many languages do you speak and did learning Spanish open many doors for you that would otherwise have remained closed? I speak four languages, although I only started learning Spanish in 2010 when I moved to Real Madrid. It’s a beautiful language that has allowed me to communicate with people all over the globe. Sami, do you read Highsnobiety? I first became aware of Highsnobiety during my travels in the U.S. last summer. Since then I check the site regularly and can only recommend it. Finally, what has moved you recently? If I were to take the word “move” literally, I would have to say my new Smart which I use to navigate Madrid. That car has already brought me a lot of joy. But to address your question in a more serious light, I would have to mention that I recently visited some orphanages in Stuttgart. I plan to provide support for disadvantaged children in my hometown region. Follow FromAtoBeyond on Facebook, visit FromAtoBeyond.com, stay tuned for more videos featuring the football star and download the app from . The post Sami Khedira Introduces #FromAtoBeyond appeared first on Highsnobiety. The German left Stuttgart for Real in the summer of 2010. ‚Los Blancos‘ paid €14 million for the German, signing a contract that runs out on 30th June. „My agent is presently in talks with Real Madrid“, he revealed when asked about his possible contract renewal. 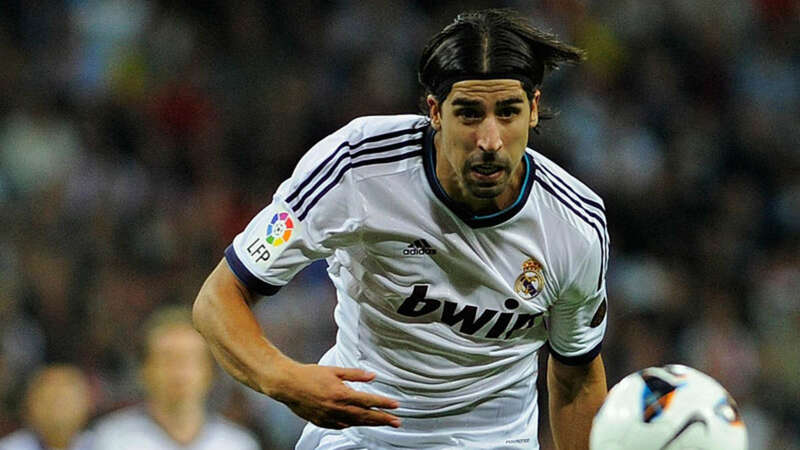 Now that he is fully recovered from the muscle tear that he picked up a month and a half ago, Khedira assured that there are still „many challenges“ that await him with the club. The Germany squad have been awarded the Silver Laurel Leaf by German Federal President Joachim Gauck following their successful World Cup campaign in the summer. All of Joachim Low’s squad from Brazil were in attendance at the Bellevue Palace in Berlin — apart from the injured Julian Draxler and Andre Schurrle — where Gauck presented the nation’s highest honour for achievement in sport. „The truth is that we all won the World Cup, or that we all feel like it in any case,“ Gauck said during the ceremony, which was also attended by German Chancellor Angela Merkel and FIFA president Sepp Blatter. „You can like it or not, but it’s a fact that football in Germany creates a strong feeling of togetherness. Germany’s World Cup-winning captain Philipp Lahm, who has since retired from international football, added: „For many of us, this isn’t our first time here. Nevertheless, this time is quite special because we brought the trophy with us. The celebrations for the World Cup winners continue in Berlin on Monday evening with the premiere of the „Die Mannschaft“ documentary.